Devices and ADHD – Is There a Connection? Cyberbullying – What can We Do? Multitasking Can We Really Do It? Are Screens Making Us Fat? TV Time – The IdiotBox? Drumroll…Screen Is Open For Business! Like many people, Thanksgiving is one of my favorite holidays. First, because we always have a great meal! Second, it’s a time when we disconnect from our busy lives and hopefully our screens, and reconnect with friends and family we may not see as often as we’d like. For now, I’m looking forward to planning meals, cooking, reading about the holiday, creating crafts, giving thanks and, and most importantly, disconnecting from screens to reconnect with loved ones. Here are some family activities for a screen ­free holiday I would like to share with you. 1. Paint a paper cup brown. Turn the cup upside down & glue a pom­pom to the top of the cop for the head. 2. Cut nine 4­ inch leaf shapes from different colors of construction paper. Fold a 1­inch­ square piece of orange construction paper in half; cut a triangle shape out of the folded paper for the beak. Using a 2­inch square of red paper folded in half, cut a heart shape to create the turkey’s wattle. Here is a link to some other ideas. Get the kids off the game consoles and into mash potatoes preparations. Here is Julia Moskin’s mash potatoes recipe. Put a large pot of water on to boil, adding a tablespoon of salt for each gallon of water. While the water heats, peel the largest potatoes you have (two per person is a good rule of thumb) and roughly cut into large chunks, about the size of a jumbo egg. Boil until tender all the way through. Meanwhile, heat any flavorings (buttermilk, milk, cream, butter, stock) you plan to add. When potatoes are tender, scoop out and set aside a cup of cooking water. Drain potatoes and return them to the pot. Place over low heat and shake until most of the steam has dissipated. Add some of your flavorings, mash, and taste. Add salt. Repeat until mashed and seasoned to your liking. Adjust the texture with cooking water. Serve immediately or cover tightly and set aside for up to 30 minutes. Here are some more ideas from the New York Times for your holiday dinner. While you and the kids are cooking, your guests are probably watching the game on the TV. If you bring out some classic board games, chances are good everyone will put down the remote and team up for some friendly competition. Everyone’s got a favorite – for my family it’s Monopoly, Apples to Apples, and Rummikub. Whether you are hosting or traveling, I wish you and your love ones a happy & enjoyable Thanksgiving. Just now, the American Academy of Pediatrics recommended that children ages 18 month and under have no exposure to screens, and that kids older than two should limit screen time to 2 hours a day. But that policy was drafted before the first generation iPad, and even the AAP now acknowledges that policy is obsolete. Screen addiction isn’t yet a clinical diagnosis in the US, but is at some countries and we’re edging toward that. According to a Kaiser Family Foundation study, 8 to 10-year olds spend some 8 hours a day glued to their smartphones, tablets, computers and TV. For tweens and teens, it’s about 12 hours. And given that the study was in 2010, it’s safe to assume those numbers are climbing. By comparison, U.S. adults are spending an average of 11 hours and 52 minutes a day with media (five hours for digital media, 2 1/2 hours on mobile devices for activities other than phone calls. What’s more, our kids are getting hooked earlier than ever. A new survey presented at the Pediatric Academic Societies in April found that infants just six months old were already logging half an hour day on mobile devices, and not just watching cartoons. A third were swiping and tapping screens. By age two, kids are using tablets and smartphones, sometimes while glued to the TV. In fact, more than 30% of kids in the US first play with a mobile device while they’re still in diapers, according to Common Sense Media. And about a quarter of all teens admit using the phones constantly, according to the Pew Research Center. Talk to parents, and you’ll get an even clearer picture: In a recent survey of 800 American moms and dads of kids aged 2 to 12, 56% of them say it’s typical for their kids to be watching different content on different devices at the same time. And kids have to get their daily fix: A majority of those parents—41%—said their child would choose their tablet over dessert. But parents are also partly to blame. Despite their concern about screen overload, two thirds of parents said they had no rules limiting their children’s screen time, according to the Kaiser study. And a recent Harris Poll found another big disconnect in parental attitudes: While 58% say that monitoring kids screen time is important, 59% say they don’t feel guilty about using mobile devices as a babysitter. Dads feel this way more than moms, as do parents aged 45 and over compared to millennial parents aged 18-34. What can we do, set limit and set an example, and set boundaries for technology. Balance between technology and real life is the key. The American Academy of Pediatrics released an updated policy statement on screen-time guidelines for parents & children. We thought we should share them with you. ■ Not for 18 month & under Discourage screen media exposure for children younger than 18 month of age. ■ 1-5 years old Limit to 1 hour a day. ■ Older kids Try to minimize use to 2 hours a day. Keep the TV set and Internet connected electronic devices out of the child’s bedroom. Monitor what media children are using and accessing, including any Web sites they are visiting and social media sites they may be using. If possible Choose high-quality programming. Co-view TV, movies, and videos with children and teenagers, and use this as a way of discussing important family values. Establishing a family media plan for all media. As part of the plan, enforce a mealtime and bedtime “curfew” for media devices, including cell phones. And we saved the best for last, lead by example. Put your device down every once-in-a-while, be present for your kids without a screen. Clue. A timeless board game. A staple of family night for decades. A Sherlock Holmes showdown. Once the most highly anticipated snow day activity, now forgotten by the new age. The screen age. This past Friday night I was charged with the babysitting duties for my 13 year old brother and his two friends. As we licked clean our plates from take-out Chinese, we pondered our after dinner options. “We can play Wii” my little brother exclaimed. “We can watch TV,” his friend said. “I don’t care….” The last one muttered. Stuck in babysitter limbo and with no clear direction to navigate this evening, I proposed that we all play Clue. “Clue? What’s that?” his friend asked. “A board game! My childhood favorite!” I exclaimed. “That’s going to take an hour…” my brother moaned. Before anyone said another word, I marched up to the game cupboard and lay the game smack on the table in front of them. They looked at the dust covered gawky box as if it were some anachronistic alien. So I made the first move, setting up each piece and explaining the rules/strategy to them as they struggled to listen. I was not going to budge, however. No matter how much they rolled their eyes and looked down at their phones, we were going to get through this game the old fashion way. No smartphones, no distractions. We only had the spirit of competition and a burning curiosity as our glue. As the game progressed, our eyes were locked. Nobody made a move for their phone. Nobody even left to go to the bathroom. We were disconnected, and it was absolutely beautiful. When the game ceased and I began to fold up the board, the kids pleaded with me to play again. Unable to say no, we embarked on a board game marathon into the night. For hours, we talked, we laughed and bonded with one another. This night taught my brother and his friends both a simple and valuable lesson about conversation and togetherness. On a normal evening by the ‘screen age’ standards, kids play video games, check social media, or browse the internet. While these activities seemingly connect kids with more people than ever before, kids have never been more alone. As the sources of entertainment become so short term and so instantaneous, it has become nearly impossible to enjoy the experience with those around you. When screens become the primary source of interaction, it is as if nobody is even there. Nobody talks, nobody laughs, nobody even moves. By putting their phones down for a short hour, however, these kids spent an evening laughing, thinking, and competing with each other. It was beautiful to see as a group of kids connected over a simple board game. By being present in the room, not in the cloud, they experienced a true sense of togetherness. I hope that they take this night and this feeling with them far into the future. Funny what a board game can do to people. Stratego is next! As parents, do you remember the sleepless nights we endured the first few months after we brought our little bundles of joy home? For many of us, we relied on caffeine, cat naps, and the promise of better nights to come to get us through those exhausting days. With a cruel and surprising sense of humor, our older children are still fighting us on sleep schedules and sleeping soundly through the night. While they are not needing a midnight feeding, many of our older children and teens are losing sleep at night due to technology usage and their digital devices. The glow of our children’s beloved electronics and plethora of screens can disrupt the circadian rhythms that affect their sleep-wake cycles. Children’s bodies are naturally programmed to interpret light and dark as signals to fall asleep or be alert. There is an abundance of research and collected data that proves the light emitted from Smartphones, gaming systems, computers, and even televisions can mix brain signals causing our kids to miss out on vital sleep. Besides biology, many of our children keep their devices next to their beds to ensure they won’t miss out on any updates or messages. This “FOMO” (fear of missing out) effects 56 percent of all social media users including our kids. Every ping or alert can interfere with the natural sleep cycle, waking a child several times a night. Parents know the power of a good night’s sleep and so do the experts. According to researchers, more than 90 percent of American teens are chronically deprived of sleep with only a mere 9 percent of high school students meeting the recommended nine hours of sleep. With numbers like those, it is fairly safe to say that our children are seriously sleep deprived. Teens and children who don’t get enough sleep tend to be more likely to experience inattention, poor impulse control, and hyperactivity. A lack of sleep can interfere with a child’s behavior and performance in school. If the mental risks of sleep deprivation aren’t frightening enough, long-term effects can be seen in higher risks of obesity and chances of developing diabetes. If a child already suffers from health issues, a loss of sleep can magnify these health issues. Ditch the technology 30 minutes before bedtime. To promote sleep, encourage family members to power down technology before you turn down the covers. Control the wi-fi. Call your network provider or read the wireless router directions for parental controls that are available. Many parental controls allow you to restrict certain websites during specific hours or require a password to gain access. Limit available data or minutes on wireless handheld devices. This strategy might not prevent children from going online at night, but it will force them to be more responsible with the time they are allotted. Create a docking or charging station by the front door. This has two benefits. A child will keep their devices out of their room and morning routines will flow smoothly without everyone dashing around looking for lost phones or wayward chargers. Consider implementing a family technology contract that includes night time usage. By laying out the expectations and consequences, you can prevent future problems from developing. Restrict phones or devices from bedrooms. In our highly connected world it is important to give children down time from electronics. Institute a family policy that all devices need to stay in common living areas. The Screen solution have a night time option built in. It allows parents to control device time and assure that sleep time is device free. Screen allows a parent to set healthy limits on all electronic devices your family uses every day, while encouraging the family discussion around technology usage. What methods does your family utilize to avoid kids using their digital devices at night? Hilary Smith is a freelance journalist who specialized in the digital world. As a graduate of NorthWestern’s prestigious Medill School of Journalism, she’s combines her love of technology, gadgets, and bulldogs with a career in freelance writing to make the world a more enlightened place. School is open, yeah!!! I can’t tell you how much I missed those school days! The yellow school busses, the rush of getting ready in the morning, the kids’ stories from school, but most of all I missed the routine. I think I am not the only one, my kids missed their routing as well (don’t ask them because they’ll never admit that). Waking up at a regular hour (not so much the process of waking them up as my kids are not the early bird type), having structured activities, dinner at the same time, and bedtime in a regular hour. As much as my kids will never admit that, I know they missed that too. While on summer break, schedule was fluid and with it screen time was fluid. They ended up consuming screens for more than I want them to. Whenever they were board their goto was a screen. Summer in NY is a challenge. Between the heat and the thunder it’s not always easy to go outside, but that should never be an excuse as it never stopped us! Now summer is over, and we are back at school. Which gives us an opportunity for a change, or better, a change back to a routine. With that routine comes our routine boundaries. One afternoon after school, we sat down as a family and spoke about what should be our screen time rules. No screens while doing homework. Take advantage of the new school year and think of what are your home rules for screens and set them. It’s easier than you think, and settings them together helps get the kids to buy into them even more. For a great school year to us all! As seen on Parents magazine. Reprinted with permission from Parents(R) magazine. (c) 2016 Meredith Corporation. All rights reserved. It’s those final late-days of summer. And, if you are like me, you may have started letting the technology and screen-time rules established at the start of the season slide a bit . . . The kids have spent loads of time biking, swimming in the ocean, seeing friends and they’ve even finished their “required” summer reading. School, along with homework and more structured time is just around the corner. But if you do let those rules slide, how do you set your children up for success and getting back in the swing of things when school starts? Discuss and set rules and times for technology (iPhone, iPad) and screen use on school days and weekends and let everyone know them in advance. If it’s homework or meal time, it’s often best to have a predetermined place in a central family location – we have a “recharging basket” — to leave phones, tablets, gaming devices that is away from the dinner table or where your child is doing homework so that there are no distractions. Encourage time without technology even when kids aren’t doing homework or eating meals. Our own family went on a “technology diet” together last fall and from 4-8PM at home, all technology was turned off. Like any new healthy habit, this one was hard to stick to for all of us (including my husband and me!). But, we did our best to remind each other and stay honest. Not only did our “diet” improve focus and attention on school work and other activities, but it boosted our connection to each other. Suddenly, there was more talking in the house. I found my (now) teenage boys in the kitchen – nibbling some, sharing about their days and offering to help out. Sounds a little surprising for a busy household of two working parents and two active teens? Well, new research out of a collaboration between the University of Michigan and the University of Washington shares that children find it easier to follow rules, particularly around technology when they had a role is setting them AND when their parents were also following them. The same study also found that children have expectations for how their parents use technology. Expectations ranged, but many of those identified by parents for their children also rang true of children for their parents, including, #1 for both groups: Be present – “the device or screen should be put down or turned off if we are talking or doing something together.” So apparently, there is something that we all can agree on. We all desire quality time, even if we need to be reminded to put our devices down to obtain and get to enjoy it. As we head into another busy school year, I encourage you to develop household rules for technology use together as a family. Ask your children of all ages what they believe should be on the list and why? How will the rules be enforced? Draft the list together – children too young to write can draw pictures. Post the list in a common area where everyone can see it. Use the Screen’s agreement and sign it. And of course, enjoy the new found, family time to come. 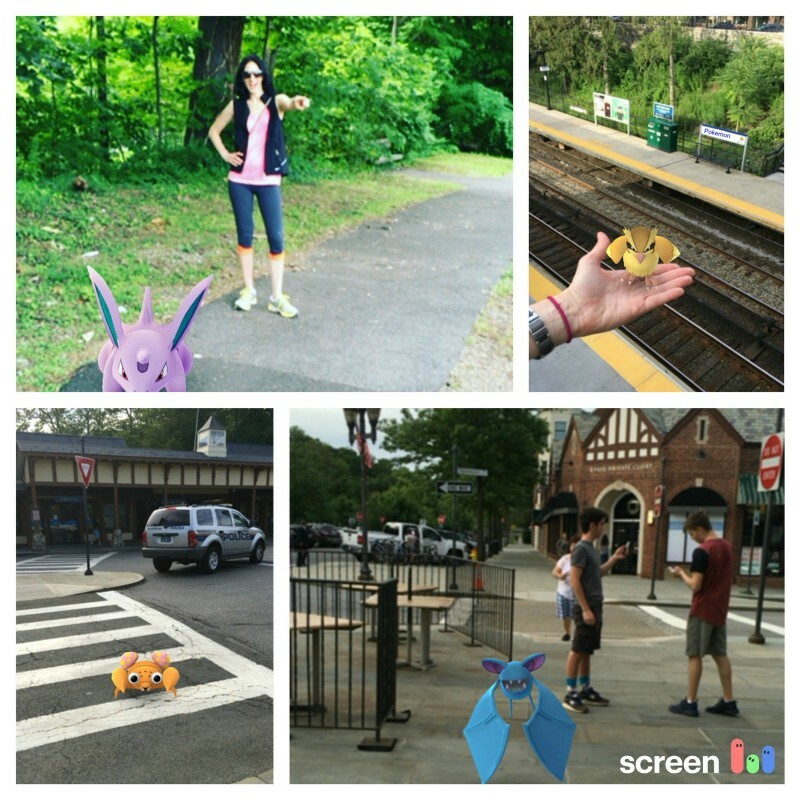 Written by Andrea Bastiani Archibald, Ph.D.
Pokémon Go, what a sensation! If you have no idea what I am referring to, it’s the new game that allow its players to travel between the real world and the virtual world of Pokémon. I see it as the first game that actually getting the kids active (and not just their fingers). Why? because they can’t help it but leave the house to find Pokémons. Since it came out everyone is talking about it, everyone is trying it and has something to say. CNN reported on the danger of playing the game. On the other hand, this game gets the kids out of the house and active. Yes, you may expect some danger to arise while hunting Pokémon. Getting into strange places, walking without being aware of your surroundings, and the ‘stranger danger’. We warn our kids about not talking to [real] strangers, not giving your information to [virtual] strangers on the internet. Yet, this Pokémon game lets us meet those strangers with a legitimate excuse. But assuming us parents set limits on where they can go, the time of day, and even better – join them in their quest – I think it’s a great activity and a good game. Yes, with Screen we keep saying we need to manage the kids screen time and get them doing something else. There are activities that count as good screen time, for example learning to play an instrument, doing math challenges, and I believe Pokémon Go falls within this category as well. I went with my 13 years old son to experience this phenomenon myself. The two and a half hours we were walking in town went by so quickly. We walked over two miles, took cool pictures with the Pokémons we found, and surprisingly enough socializing with people in town that were on the same quest. Who would have thought the couple with the two and a half year old son, the local policeman, and the 3 high school senior girls will even speak with us, but we were cool (well mostly him), as we knew what to do and where to go. My son and I bonded, talked! Something you will not see us (& people) do often. We used our common sense in terms of where to go, “looked up” and observed our surrounding (well, more me than him), and had a blast! For some non-Pokémon fans that has no clue of this world and wish to take this as a bonding “screen free” opportunity, here is a useful article from Forbes. Go Pokémon hunting, it’s fun! One summery afternoon, I decided to tempt my kids with an outing for ice cream and the park. It wasn’t easy to unplug them from their devices. In fact, it took some creative thinking and the help of their friends’ moms, but we did it. We scheduled to get together downtown at their favorite ice cream parlor. We applied some peer pressure, and they all came. As the last child was about to finish his cookies and cream with rainbow sprinkles, we managed to guide them to the adjacent park. Five minutes didn’t pass before the first representative from the kids* appeared. Fifteen minutes passed, 20 minutes passed, and – SURPRISE! – no one came to complain. The kids were happy, playing, and engaging with their friends in their “new” world using sticks and rocks they found at the park; their virtual world waited for another day. Apparently, the alternatives to electronics aren’t so boring; we just need to show our kids the way, give them a little push, and they will figure out the rest. I know my children are fantasizing about this long Fourth of July weekend, when they plan to socialize with their electronic devices, but I have other plans for them. We will have to find a way to do both – engage in the real world and the virtual one! I challenge you as well, during this holiday weekend: Go outside, barbecue (with no cell phone), take a bike ride, play in the park, go swimming, hike, play Monopoly at home, anything!!! Embrace family time – and please don’t forget to share your experience with us here! In the meantime, be well and enjoy the summer!